What started as a typical International Visitor Leadership Program (IVLP) visit ended as an extraordinary event. International House (IH) was asked to coordinate the visit of nine park managers from Thailand through the International Visitor Leadership Program (IVLP), a premier professional exchange program coordinated by the U.S. Department of State’s. When IH Program Director Johnelle Causwell arrived at the Knoxville Airport to pick up the group, which included Superintendent Krissada Homsud of the Khao Yai National Park, no one knew that the trip would end with such exciting news. 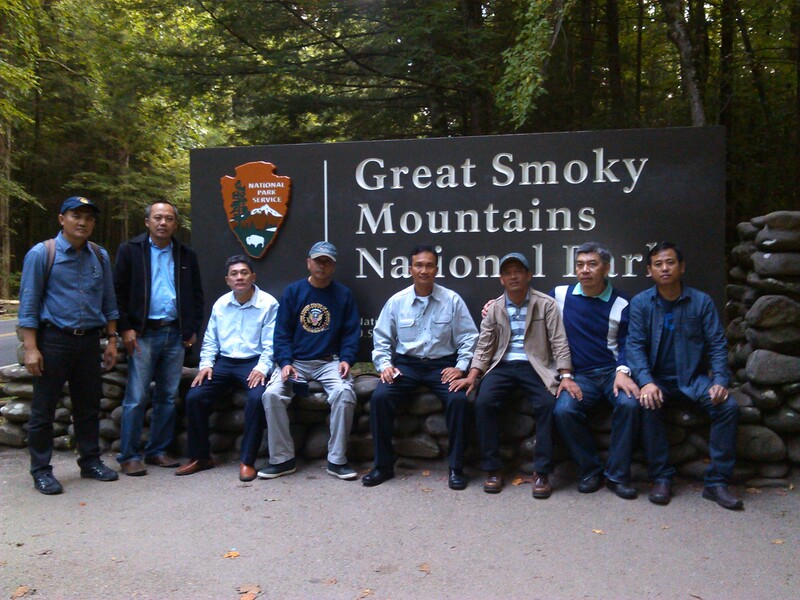 Unbeknownst to the group, officials in the Thai and US governments were finalizing wording for the first Sister Park agreement for both the Great Smoky Mountains National Park and The Khao Yai National Park. Although not exactly twins, the two parks share a number of similar resources and protected area management and operational concerns. The significant biodiversity of both Khao Yai and Great Smoky Mountains is at the center of their mission and programs. Both parks are the most visited National Parks within their respective countries, which presents similar challenges associated with high visitor use, along with potential impacts due to adjacent land use and development. Both parks are popular for spectacular wildlife viewing, streams and waterfalls, and lush mountain forests. During their visit, the Khao Yai National Park delegation met with GSMNP Park managers, biologists, entomologists, educators, historians, and facility managers offering the opportunity to learn about resources in the field and to cultivate relationships for future information exchange.